"Affinity" redirects here. For the Smasher, see Smasher:Affinity. Umbra Clock Tower as it appears in Smash. for 3DS Main: Let's Hit The Climax! for Wii U Let's Hit The Climax! Main: Let's Hit The Climax! Umbra Clock Tower (アンブラの時計塔, Umbra Clock Tower) is a stage from the Bayonetta series. It is the final downloadable content stage in Super Smash Bros. 4, released on February 3rd, 2016. The stage returns in Super Smash Bros. Ultimate. In Ultimate, Bayonetta is fought here for her unlock battle. Umbra Clock Tower is identical in layout in both Super Smash Bros. for Nintendo 3DS and Super Smash Bros. for Wii U. The battle begins and takes place on the face of the clock tower, while in an infinite free fall. The clock face itself is slightly recessed from the surface of the broken tower piece, creating a small incline. Occasionally, falling debris comes close to the main clock face platform, serving as extra platforms; both hard and soft platforms can appear, creating temporary walk-offs and caves of life. There are seven possible layouts that appear in a random but sequential order. Similarly to Town and City, the layouts themselves contain many platforms moving in different directions, then eventually leaving the stage. However, unlike Kalos Pokémon League, this stage forces characters to fall through soft platforms as they exit. Players enter and exit the alternate world of Purgatorio throughout the match, which is indicated by a specific sound and a very large rising purple portal that represents Umbra Witch magic. The angels Affinity and Inspired only appear and fly around in the background of Purgatorio, and occasionally the enormous Fortitudo comes close to the playing field and lets out a powerful roar, shaking the screen. However, none of them have an actual effect on the battle and mostly act as extravagant aesthetics. In 8-Player Smash, it does not enter the world of Purgatorio, hence the angels won't show up in the background. Star KOs and Screen KOs are disabled in both versions of Smash 4. This makes it one of two stages in Smash 3DS where Screen KOs cannot occur, with the other being Super Mario Maker. It is also the only stage in the game where only Blast KOs occur. In Super Smash Bros. 4, the Ω form is mostly identical to the normal form of the stage, but the extra debris platforms will no longer appear, and, as a result, the camera will no longer zoom and shift. The clock face is no longer slightly recessed and is completely flat. The angels still appear, including Fortitudo and its roar. In Super Smash Bros. Ultimate, the Ω form and Battlefield form are similar to the Ω form in SSB4; however, the main platform is resized and reshaped to match Final Destination and Battlefield, respectively. The three soft platforms of the Battlefield form are made of stone and resemble the stone debris platforms that occasionally appear in the normal form. The Clock Tower in Bayonetta 2. The Umbra Clock Tower is a reference to the opening of Bayonetta, where Bayonetta and Jeanne fight angels on top of a falling clock tower face during the Witch Hunts. 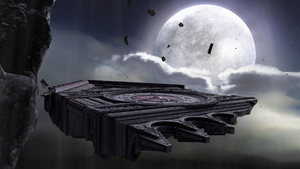 The stage also appears in Bayonetta 2 when Bayonetta is sent back in time. Forced to re-experience the Witch Hunts all over again, while fighting by the side of her mother Rosa, Bayonetta and Rosa witness the clock tower's destruction first-hand, due to two giant fireball attacks by the angel Fortitudo. The resulting explosion causes Bayonetta and Rosa to fall off a cliff together—a different side to the one Bayonetta's past self and Jeanne fell off. As it begins crumbling, Rosa calls the tower the "Symbol of the Umbran Way" and begins mourning its destruction, showing that the tower itself had significant meaning to the Umbran culture and their way of life. 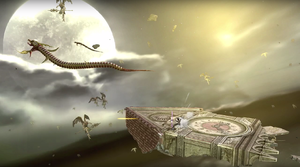 Affinity, as it appears in Bayonetta. Inspired, as it appears in Bayonetta. Fortitudo, as it appears in Bayonetta. In the Bayonetta series, there are three different dimensions called the Trinity of Reality: the Human World, Paradiso, and Inferno. Purgatorio, an alternate reality to the Human World which Angels and Demons can use to influence the Human World without having to directly enter it, exists between them. Umbra Clock Tower is currently listed as a Counterpick/Banned stage in competitive play, but this ruling has been heavily disputed in the community. 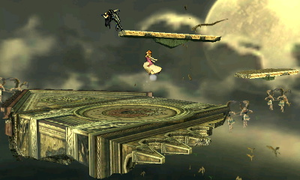 Arguments to ban the stage include the appearance of temporary walk-offs (even though many of the walk-offs can be escaped from below) and that the platform that briefly appears below the stage creates a temporary cave of life, and any fighter on that platform when it leaves can be easily edgeguarded. It was also suggested that the Purgatorio background can be distracting to some players with attention problems, like the backgrounds of Final Destination and Lylat Cruise. Tournaments that have larger stage lists that encompass stages such as Delfino Plaza and Castle Siege have been more likely to allow the stage as a counterpick, but so far it has not been used in any major tournaments because these larger events have more restrictive rulesets. The stage is also said to cause motion sickness for some players due to the constantly moving background. However, some smashers argue that the stage was banned without proper testing, saying that the stage as a whole is less intrusive than the likes of Pokémon Stadium (which has always been legal in Melee) and that its inclusion would give a new option with big blast zones to the stage list, which currently has several stages heavily benefiting characters that K.O at the top. Despite this, the stage has remained banned in most major rulesets and has only been legal at smaller tournaments. Umbra Clock Tower in Super Smash Bros. for Nintendo 3DS. Bayonetta on Umbra Clock Tower in Super Smash Bros. for Nintendo 3DS. Umbra Clock Tower in Super Smash Bros. for Wii U. Inspired's appearance in Super Smash Bros. for Wii U.
Panorama of Umbra Clock Tower from Ultimate. Bayonetta taunting on the stage. A closeup of Bowser on the stage. Cloud using Cross Slash on Diddy Kong on the stage. Knuckles mid-air on the stage. Marshadow stunning Bowser Jr. with Spectral Thief on the stage. Meta Knight on the stage. Young Link in his alternate costume based off of Dark Link using his down aerial on the stage. Rosalina & Luma using their side taunt on the stage. Alucard attacking Meta Knight on the stage. Isabelle and Bayonetta on the stage, ready to fight. The time shown on the face of the clock matches the respective game system's internal clock in real-time. However, if the game is paused, the clock stops counting, and when un-paused, the clock instead skips ahead and resumes counting from the current time on the system. In Super Smash Bros. for Wii U, both the Fortitudo and Inspired angels in the background are rendered as 3D models, while in Super Smash Bros. for Nintendo 3DS they are sprites due to hardware limitations. The Affinities appears as sprites in both versions of the game, but animate at 60 FPS in Super Smash Bros. for Wii U and 30 FPS Super Smash Bros. for Nintendo 3DS. This is the only stage in Super Smash Bros. for Wii U without Screen KOs to appear in demo sequences. This page was last edited on April 16, 2019, at 02:41.